FORMER DONALD TRUMP advisor Steve Bannon has refused to answer questions from a congressional committee probing the president’s campaign links to Russia, saying he was under orders from the White House not to. 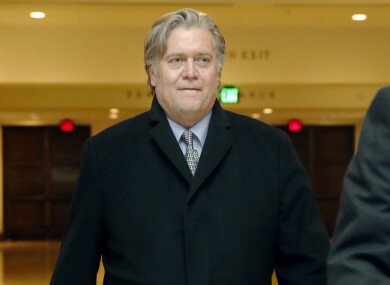 Bannon was quizzed voluntarily behind closed doors by the House of Representatives Intelligence Committee, the first time he has testified in the probe investigating whether Trump’s campaign colluded with Russia in its bid to influence the 2016 US elections. However, it was unlikely to be Bannon’s last such testimony. The New York Times and the Washington Post reported last night that Bannon has been subpoenaed by Robert Mueller, the Justice Department special counsel investigating the same issue. That made Bannon the first person from Trump’s inner circle to receive a grand jury subpoena from Mueller in the probe, which is also looking at whether Trump has tried to obstruct the investigation. When appearing before the Intelligence Committee, Bannon refused to answer a number of questions, citing “executive privilege” allowing the president to keep information from the public. “Steve Bannon and his attorney asserted a remarkably broad definition of executive privilege,” Representative Jim Himes, a Democratic member of the committee, said on CNN. “Now remember, it’s the president who has the executive privilege and so they went back, conferred with the White House, and the White House said that anything that happened, any communications that happened while Steve Bannon was in the White House or during the transition, any communications were off limits,” Himes said. “There were an awful lot of questions we weren’t able to answer based on this novel theory of executive privilege,” he said. “[Bannon] got the same instruction back again. Basically, we don’t care whether it’s under compulsory process or a voluntary basis – we’re instructing you, effectively putting in place a gag rule,” said Schiff. The unrestricted testimony of Trump’s estranged political strategist could be explosive. He had a front-row seat as chief executive of the 2016 election campaign in its final months, and as a top policy advisor in the first seven months of the administration. An incendiary book released last week, Fire and Fury: Inside the Trump White House by Michael Wolff, quoted Bannon as saying that a pre-election meeting involving Trump’s eldest son Donald Jr and a Kremlin-linked Russian lawyer was “treasonous”. Wolff, who painted a picture of an erratic and poorly informed president, was given substantial access to the White House during Trump’s first year by Bannon. A hard-line nationalist who sought to shake up US domestic and foreign policy, Bannon, 64, was forced out as Trump’s chief strategist in August. His actions since then – most notably supporting the failed Senate campaign of Alabama Republican Roy Moore, but also his comments in the Wolff book – have left him increasingly isolated in conservative circles. Underscoring the break, Trump said Bannon had “lost his mind” and branded him “Sloppy Steve” via Twitter. Email “Steve Bannon refuses to answer lawmakers' questions following 'White House instructions'”. Feedback on “Steve Bannon refuses to answer lawmakers' questions following 'White House instructions'”.